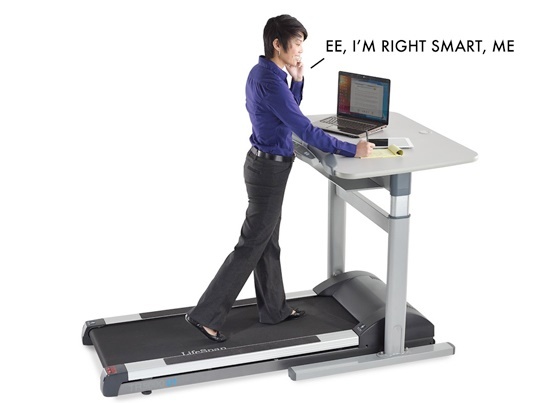 Treadmill desk is a traditional computer desk but adapted for use with a treadmill. You can walk and maintain your health while working in office. It reduces risk of diabetes, heart diseases, obesity and loads of other health problems. These desks have been around for a long time, and have been readily assimilated into the work culture. If you still are not convinced of spending 1,000$ for an exercising desk then there is some more news for you. Researchers have conducted a test where they found that these desks won’t just make you healthier but also smarter. The test involved 18 students of Montreal area who were divided in two groups. 9 students were asked to read some dummy texts and emails while walking on treadmill desks. The other half read them while sitting down. Later, they were wired to an EEG machine; then asked some true-false questions based upon their comprehension of the text. It was found that the treadmill guys outperformed their sitting counterparts by 34.9%. EEGs also showed that the group who read on the treadmill desk showed more attentiveness and better retention. The study is in sync with the fact that walking improves mental and physical health. You might consider buying one, as the increased productivity will be worth it.